The easy way to learn the Colregs! Welcome to Collisionregs, the home of the Colregs Audio MP3 recording. For nearly 15 years we have been helping seafarers pass their exams by learning the Colregs an easier way. 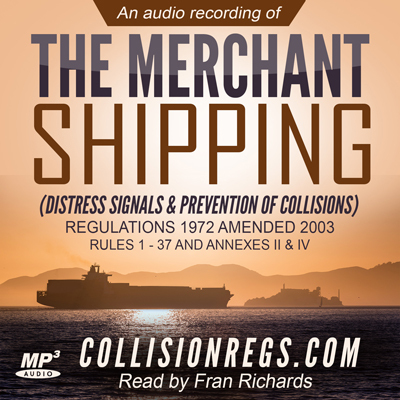 If you want to learn the International Regulations for the Prevention of Collisions at Sea (Colregs), buy our MP3 and download instantly. Collisionregs is fully up-to-date, taking account of the amendments introduced in November 2003. Our recording is suitable for all commercial and leisure mariners, Officers and Cadets. You can listen to a sample track, read about subliminal learning, discover the face behind the voice or buy now online with instant MP3 Download. You can also print off a copy of the Collision Regulations, buy recommended Maritime Books or simply browse our useful information and free resources section. Collisionregs has been designed with repetition based learning techniques in mind, that is, by listening to the recording over and over again, gradually one will start to learn the content, in much the same way as people pick up the lyrics to songs having listened to them on the radio, or in nightclubs etc. It is also possible for the mind to learn to some extent, by subliminal learning, for example by having Collisionregs playing in the background or even whilst asleep! However, repetition is the key. This Colregs recording was professionally recorded after being commisioned by Deck Officer Chris Barrows, when he was approaching the end of his cadet training with his MCA Orals looming over the horizon. Chris explains "There are certain rules which one is expected to know verbatim and some suggest we should know them all parrot fashion. I, like many others, found it rather boring, struggling to learn them in a conventional fashion. I decided a recording of the rules would be a very useful tool to help commit them to memory. To this end, each rule has been recorded as a separate track, so as to be able to take advantage of the repeat track functions found on most MP3 players. "I actually learnt rule 19 whilst driving up the M1 motorway on my way back to college!" recalls Chris, who is now an experienced Master Mariner. Collisionregs was first released in 2003 and since then has helped hundreds of people prepare for and be successful in their professional seafarers exams. Note - Photos posed by models! 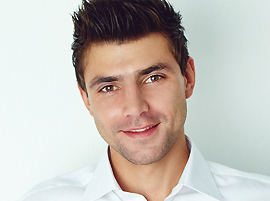 "Collisionregs helped me tremendously when I was studying for my OOW oral. I subsequently used it to refresh the Colregs before my Mates and Masters too. Brilliant!" A canny way to learn the rules! Thank you so much. Thanks Collisionregs. Your recording really helped me learn the Colregs quickly and easily, especially as English is not my first language. I wish I had known about Collisionregs when I was a Cadet! Still it was a great help during my revision for my recent Chief Mates Oral and I'm pleased to say I passed first time - thanks for your help.